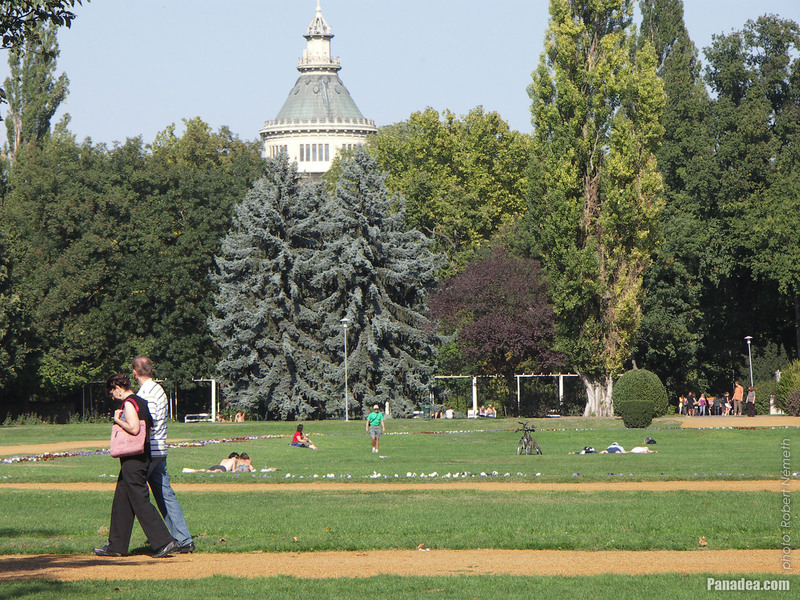 The Kossuth Square around the Hungarian Parliament Building is just undergoing a serious transformation. 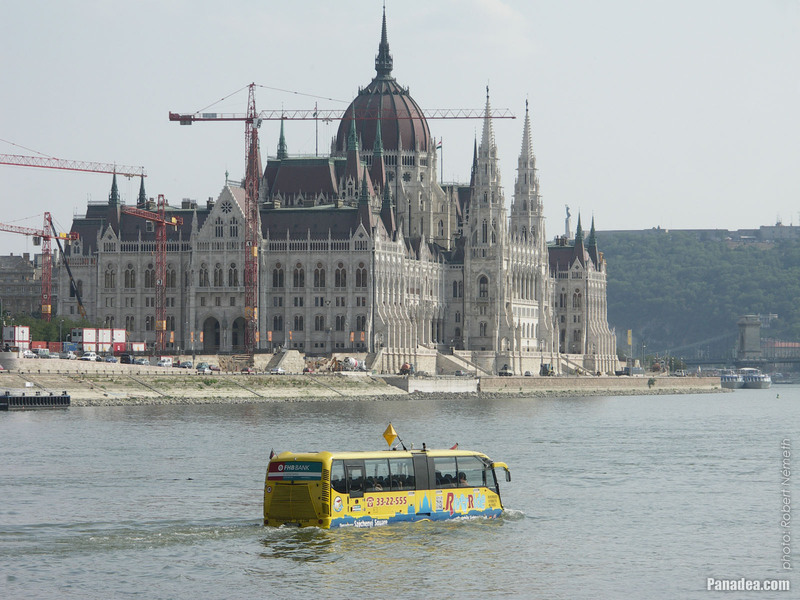 At the south side of the Parliament building the tower cranes just build the underground garage, as well as the visitor center that will be also under the pavement level. 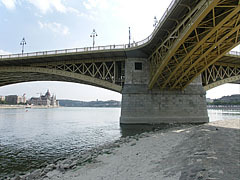 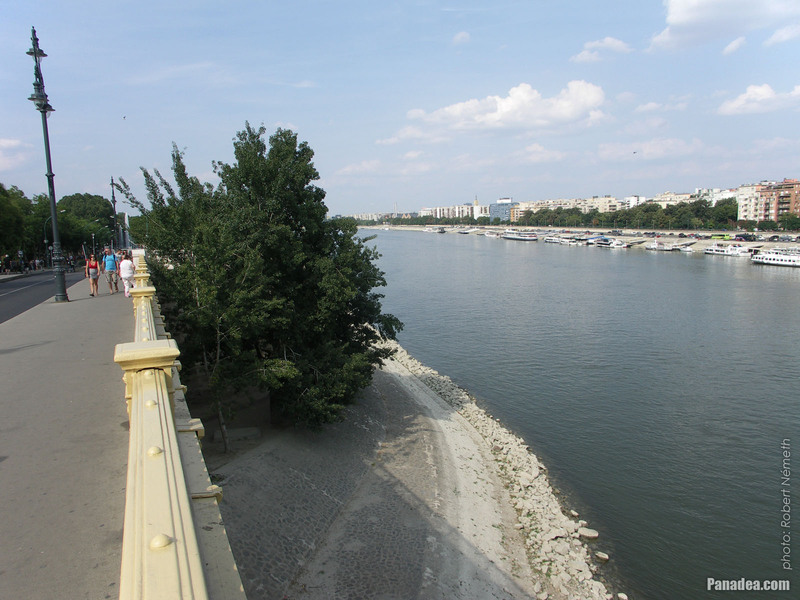 In addition the Széchenyi Chain Bridge and the Gellért Hill can be seen on the right. 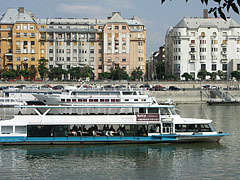 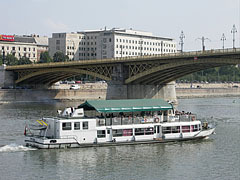 The boat was constructed in 1980 in Moscow, Soviet Union (today Russia). 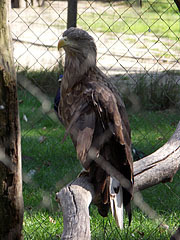 The owls and other predatory birds (bird of prey) came into the Pet Zoo of the Margaret Island injured almost without exception, probably they would have died without human care. 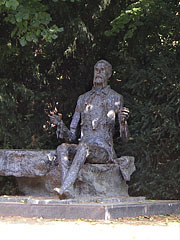 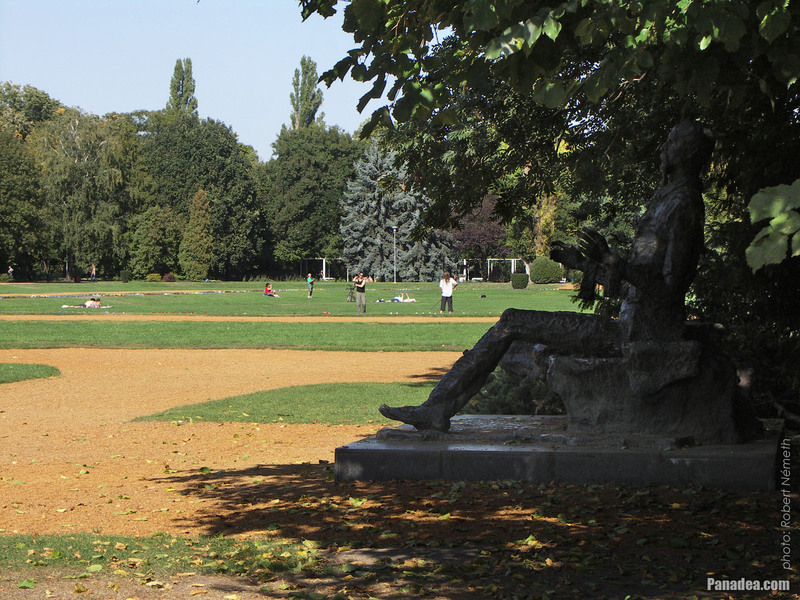 The modern style bronze statue of the Hungarian writer Imre Madách on the Margaret Island was created by Imre Vilt in 1973. 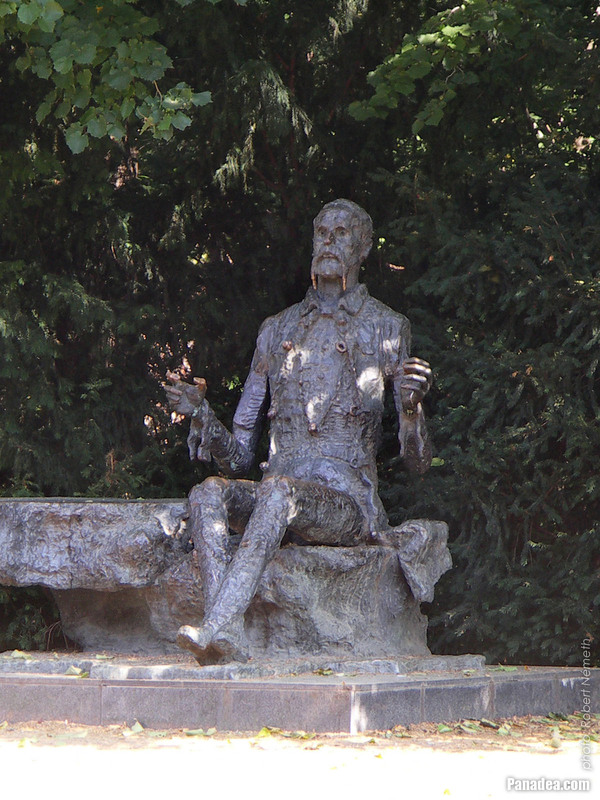 Originally there was a stick in a hand of the figure, but in the meantime unfortunately it was "lost". The sorrowful fate of the artwork is even worse because both hands were sawed-off illegally by metal thieves firstly in 1997 and also in 2013. 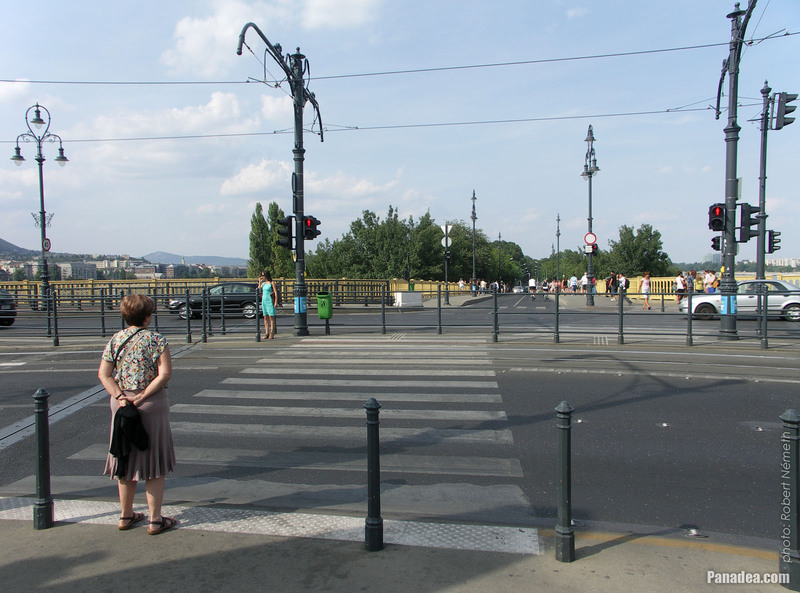 The pedestrian crossing with the traffic lights was appeared on the Margaret Bridge after its big renovation of 2013, earlier there was a pedestrian subway here to provide crossing to the other side of the road. 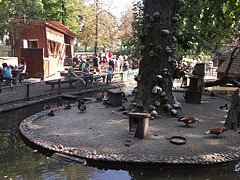 However this was a relatively dark place and thanks to certain people after some time it became stinky and depressing, so it was abolished probably due to this. 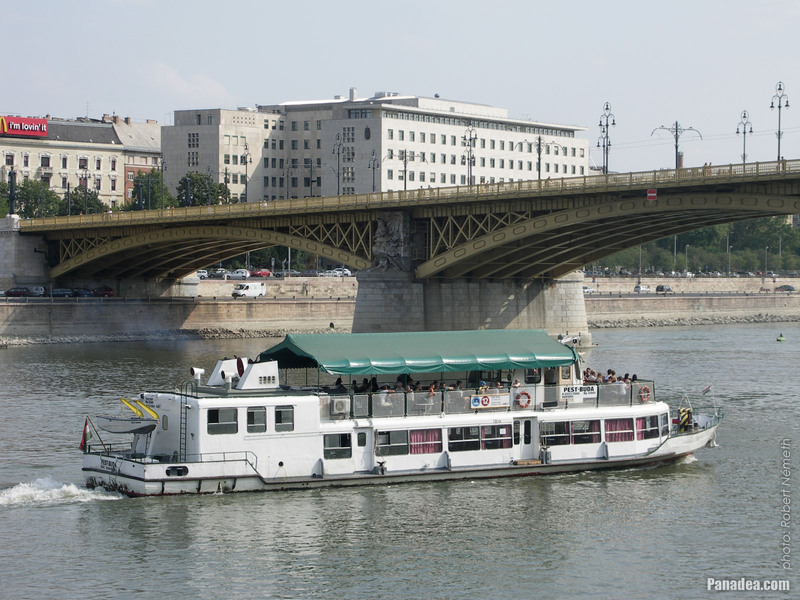 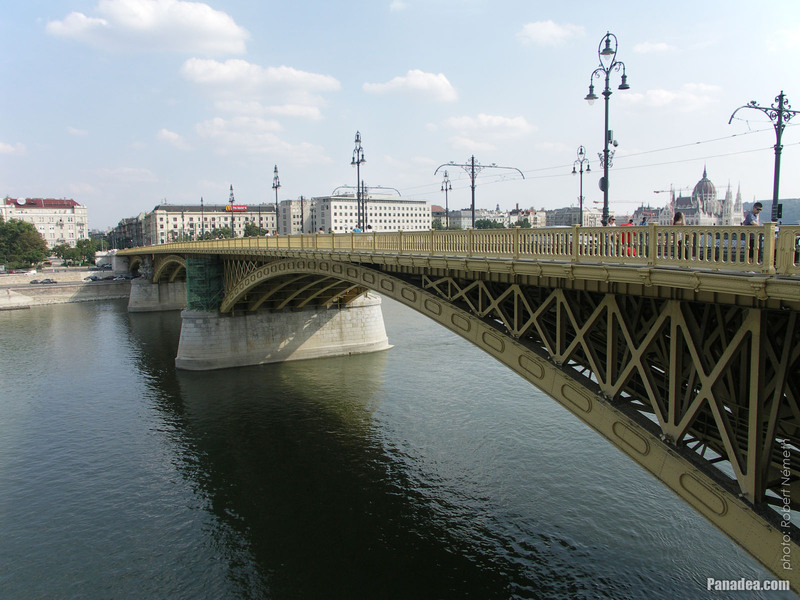 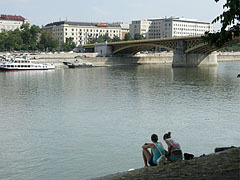 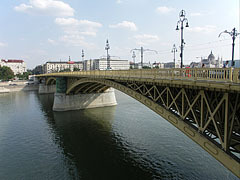 Although the Margaret Bridge ("Margit híd") was constructed in 1876, the branch (wing) to the island was build later, just in 1900. Among every Danube bridge of Budapest this is the only one span that survived undamaged the World War II. 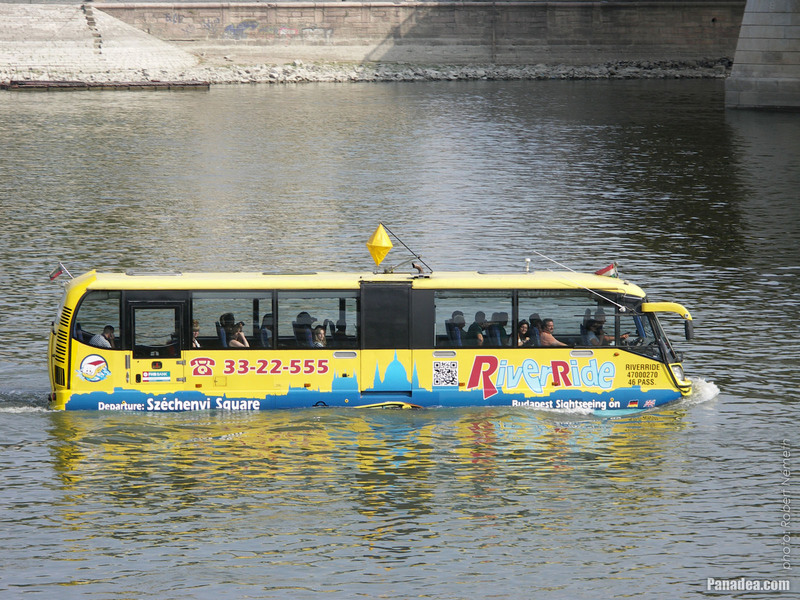 This amphibious sightseeing vehicle is a swimming bus and wheeled pleasureboat in one. 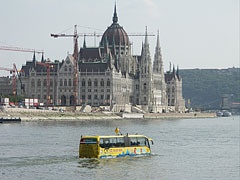 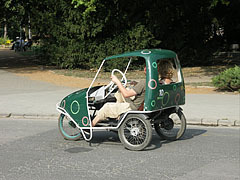 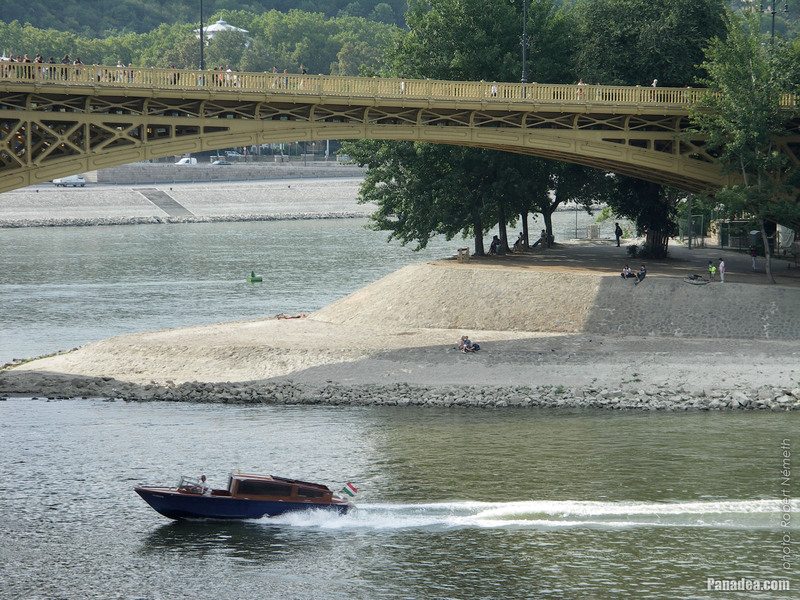 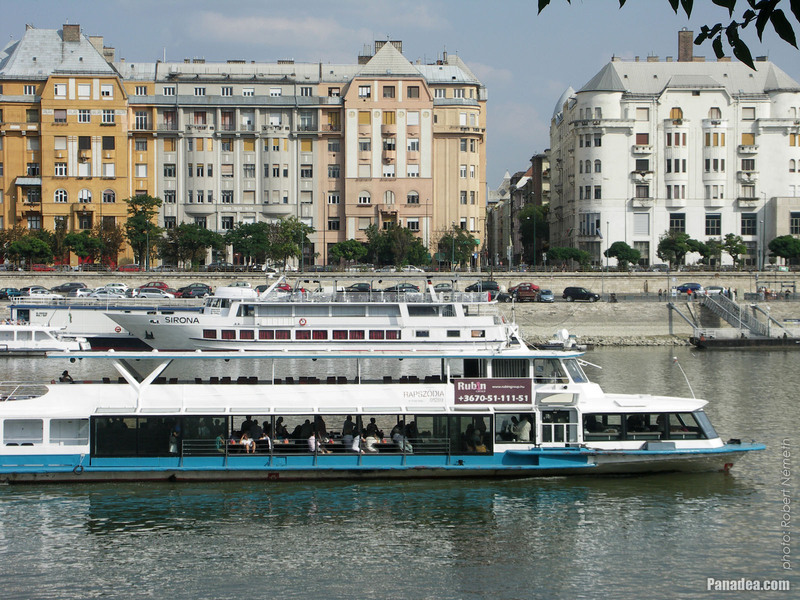 It travels on the roads of Budapest and as well as the Danube River since 2009, at that time it was the first one in its category in the continental Europe. 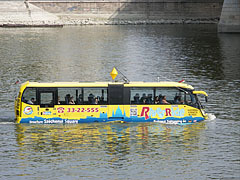 Although there were already so-called water taxi or water bus boats on regular services, but this one is the real water bus. 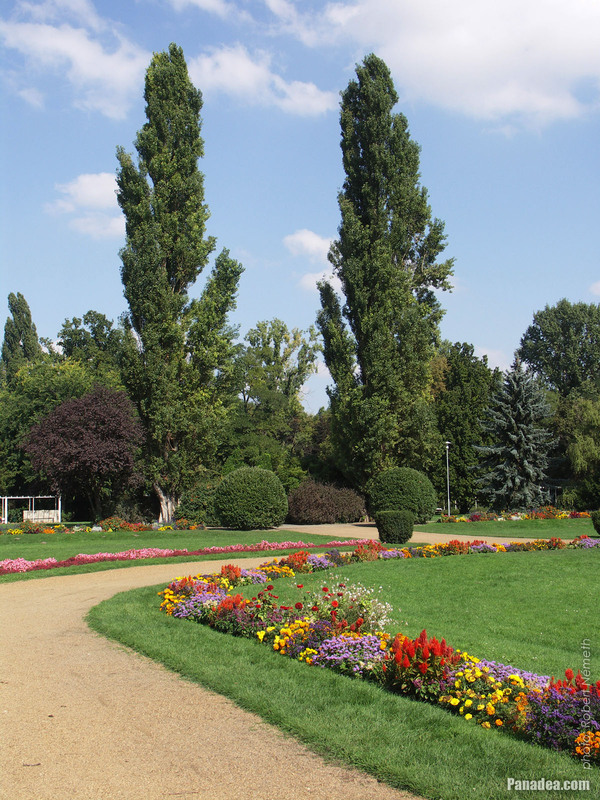 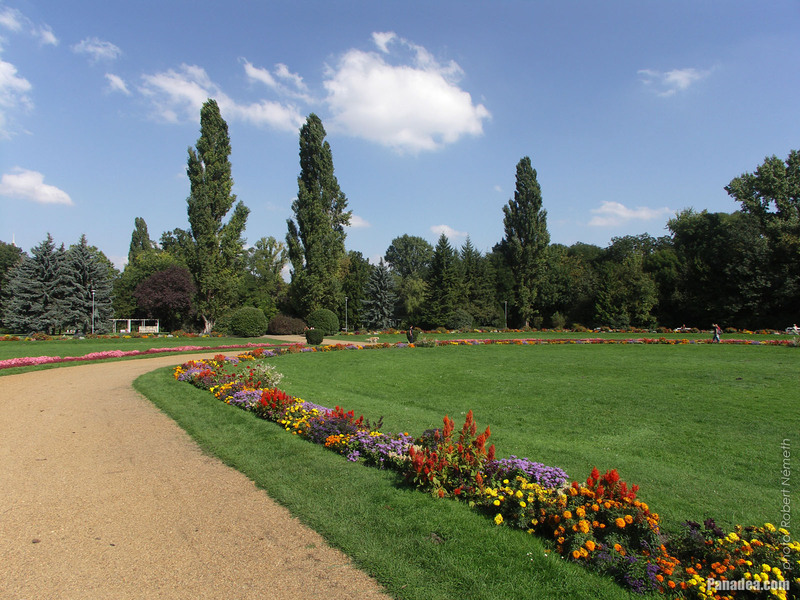 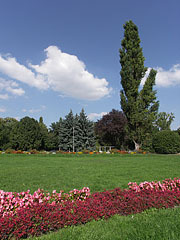 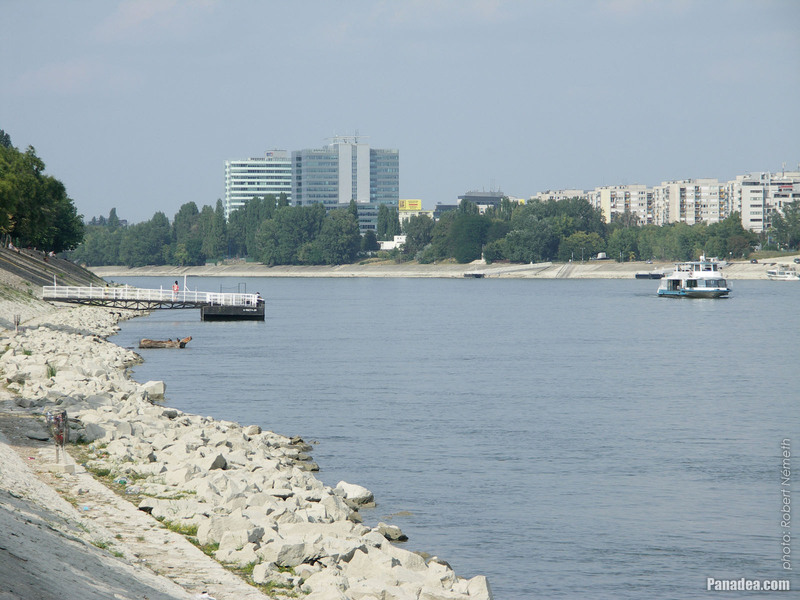 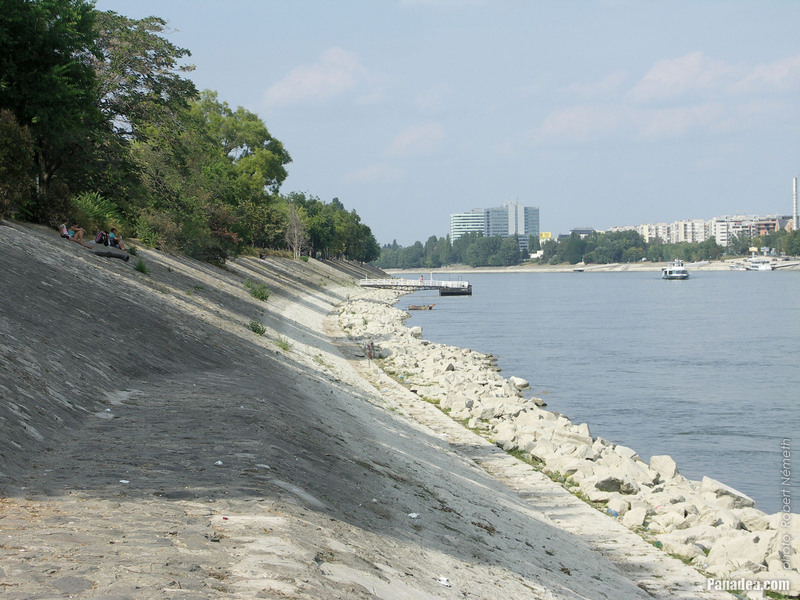 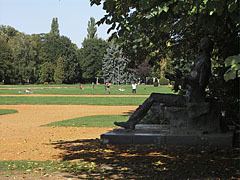 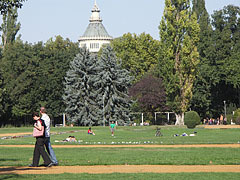 Until 2013 the Margaret Island ("Margit-sziget") was administratively part of the 13th district, but in spite of the result of the referendum in August the area was taken away from the 13th district and "moved" directly under the administration of the capital city. 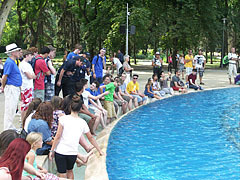 The incident is spicy even though the population of the island is just 3 people. In accordance with the public opinion the two persons who voted (67%) wanted to continue to belong to the 13th district. Possibly by political motivations the referendum was ignored and understated. The conservative right-wing leadership of the capital city and the country seemed to take the island away from the traditionally left-wing district anyway, probably because it is a touristically important valuable part of the city. 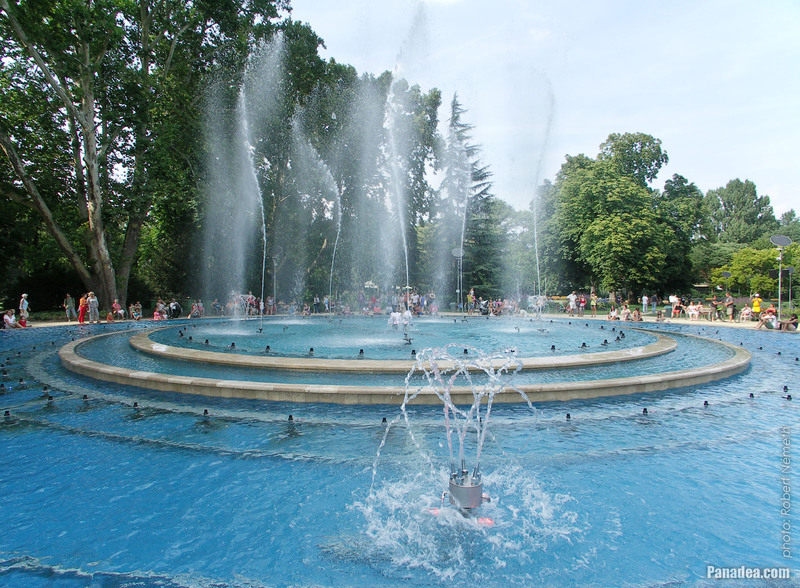 The Great Musical Fountain on the Margaret Island is one of the largest fountains in Hungary, it has a diameter of 36 meters and the central water jet can squirt even to 25 meters high. 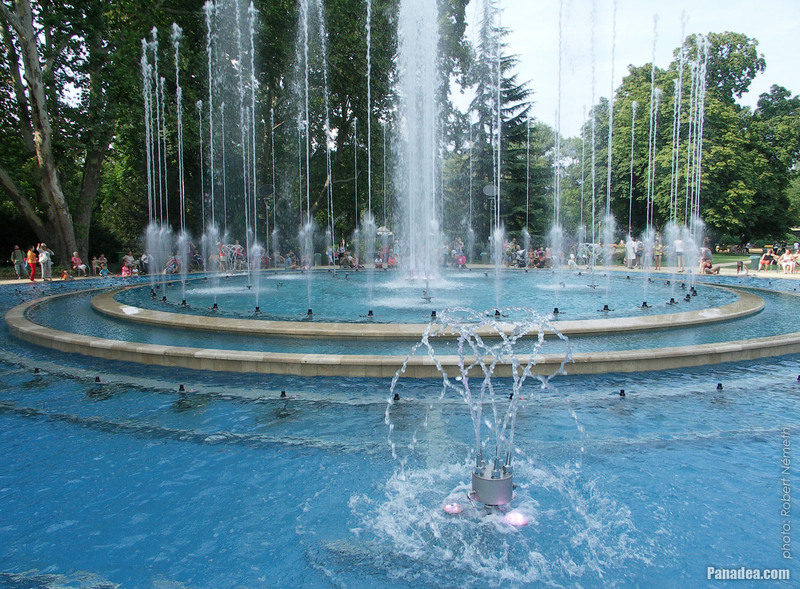 The pool of the fountain in this form is 1000 square meters in area, 154 integrated water jets and 227 colored lights assist to display very impressive musical programs. The renovation was done by the Ganz HYDRO Kft. 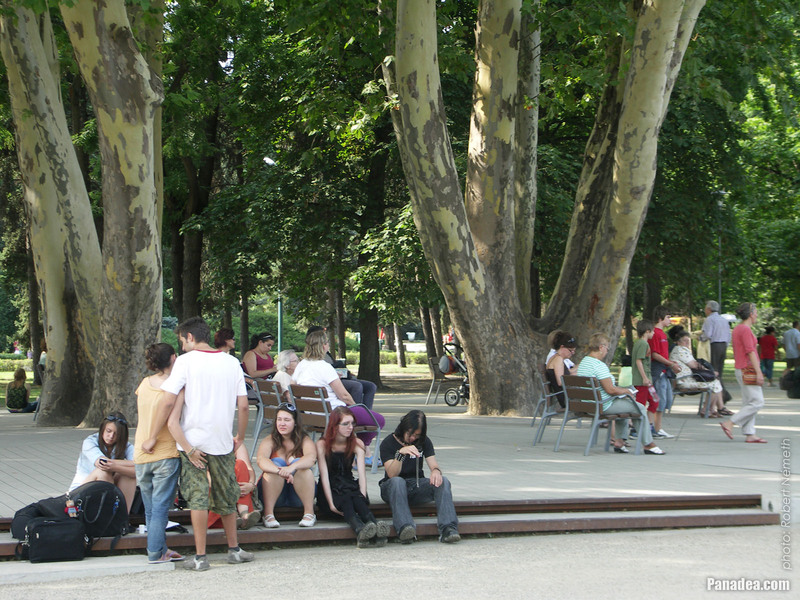 company in the summer of 2013. 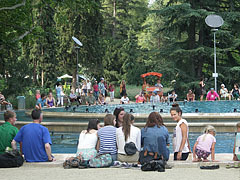 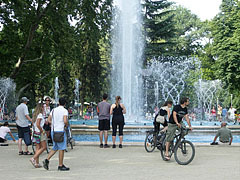 After 2002 the Great Musical Fountain of the Margaret Island was again renewed and also slightly modified in 2013. 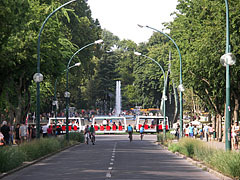 Unfortunately the inauguration ceremony of the fountain quite well demonstrates the happenings concerning the island in 2013 (by a political decision the right-wing parliamentary majority detached the island from the left-wing 13th district, in spite of the result of the referendum). In the summer of 2013 the lord mayor of Budapest István Tarlós and Viktor Orbán prime minister together inaugurated the fountain with big words and fanfares, such as a political force demonstration. 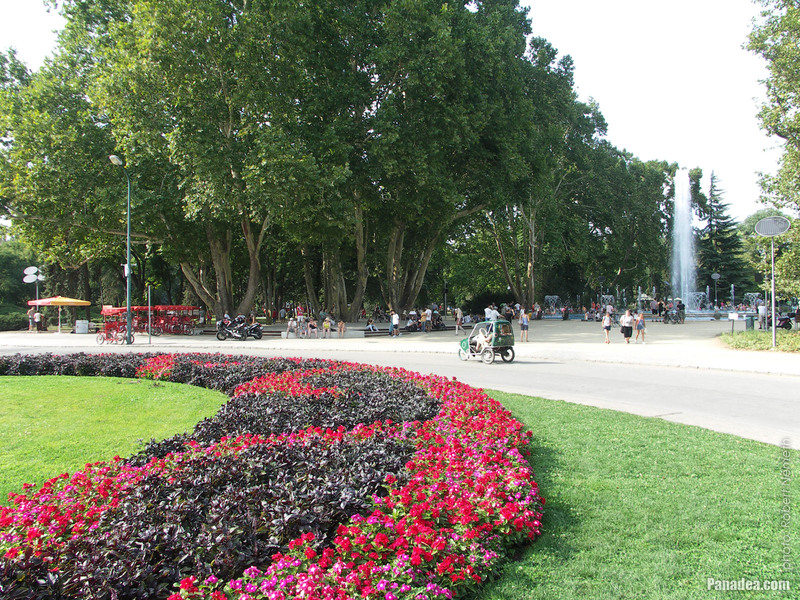 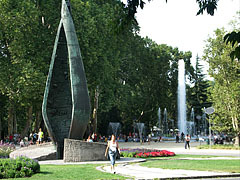 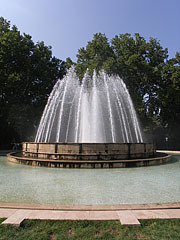 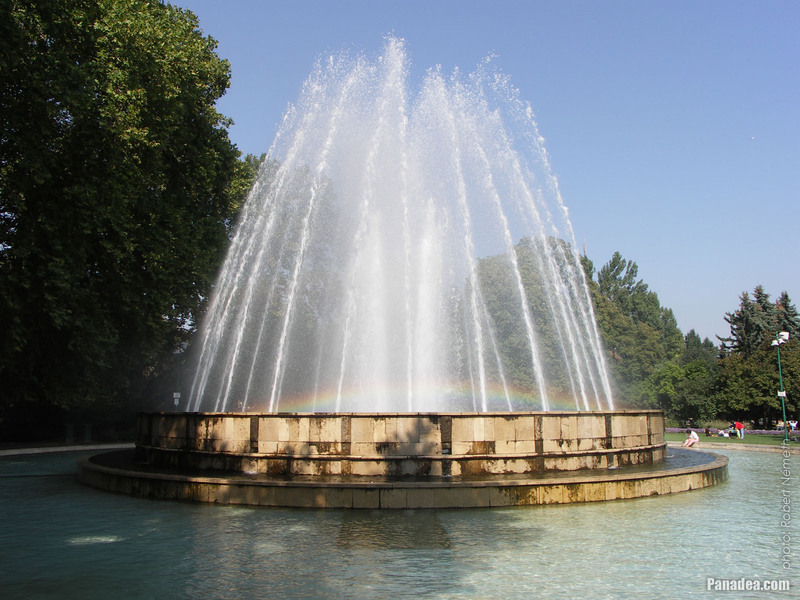 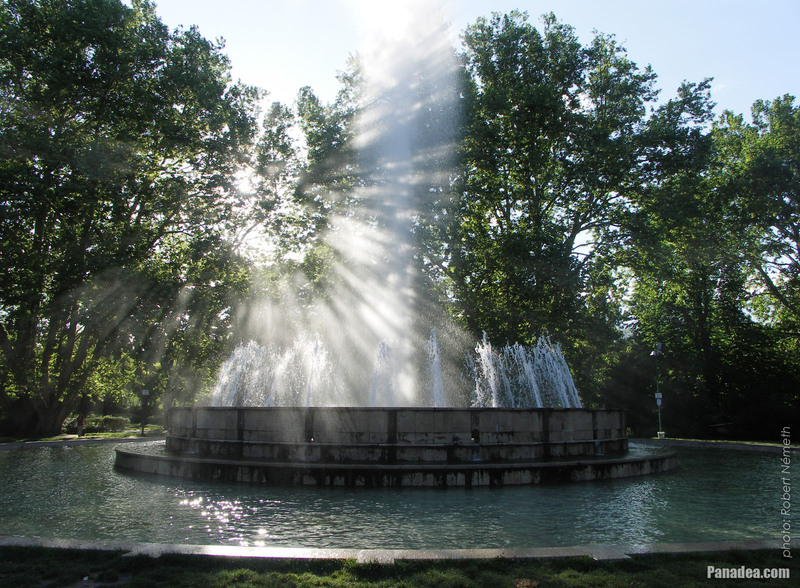 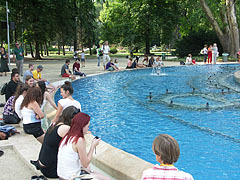 But nevertheless this is still just a fountain, even it is the largest in Hungary (and it was the largest even before). 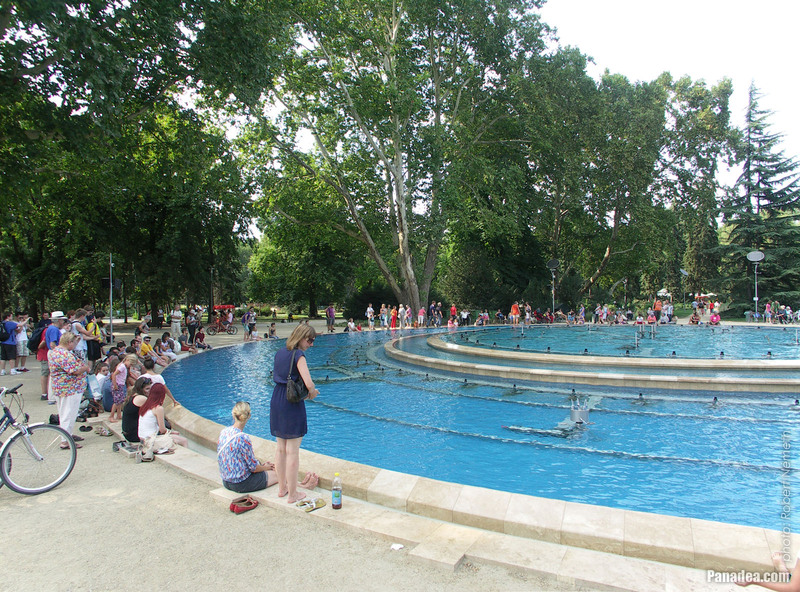 But regardless of the political overtones the new fountain really wonderful and it is an unavoidable attraction. 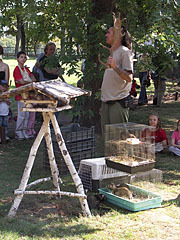 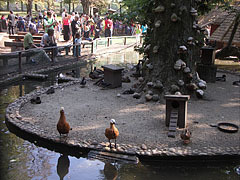 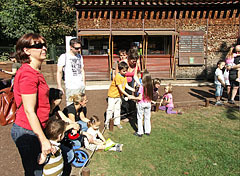 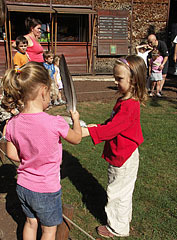 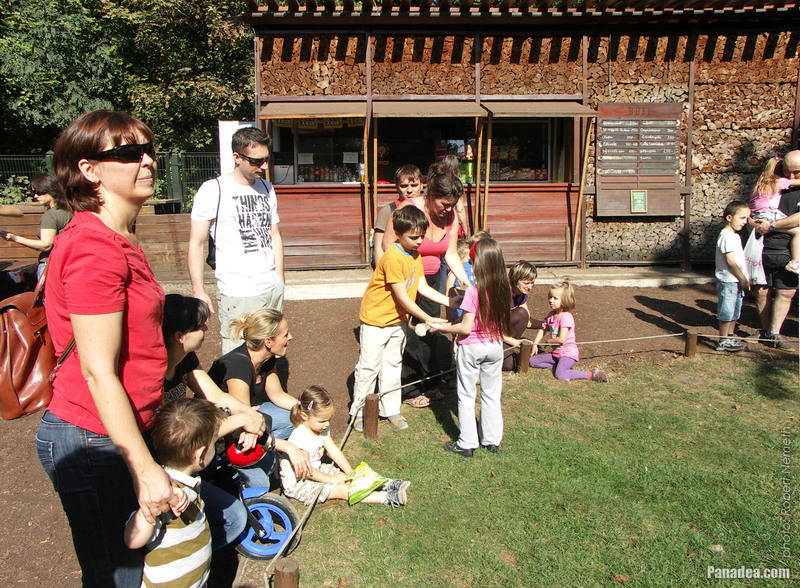 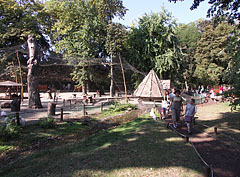 The tiny zoo on the Margaret Island (in Hungarian "Margit-szigeti Vadaskert", also known as Pet Zoo) had major changes in the early-2000s, the old buildings were demolished and new light and airy buildings were raised that remind to woodpiles. 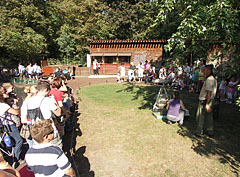 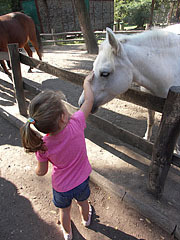 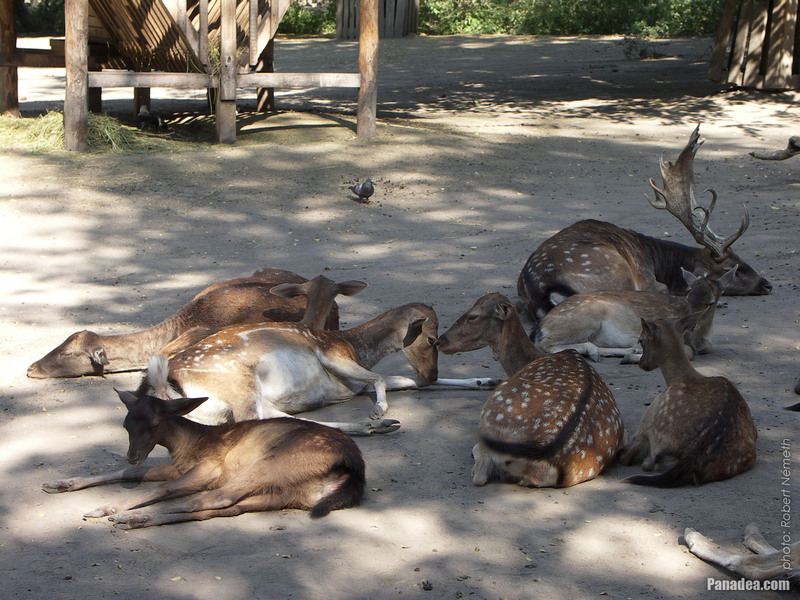 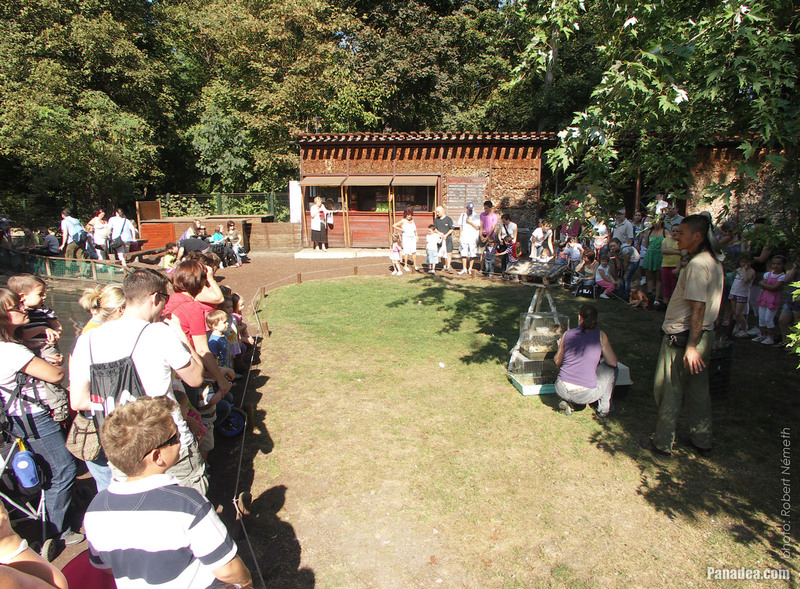 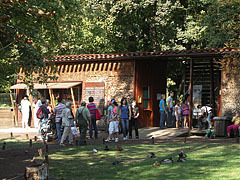 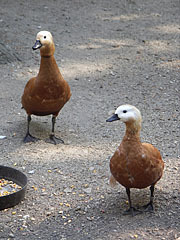 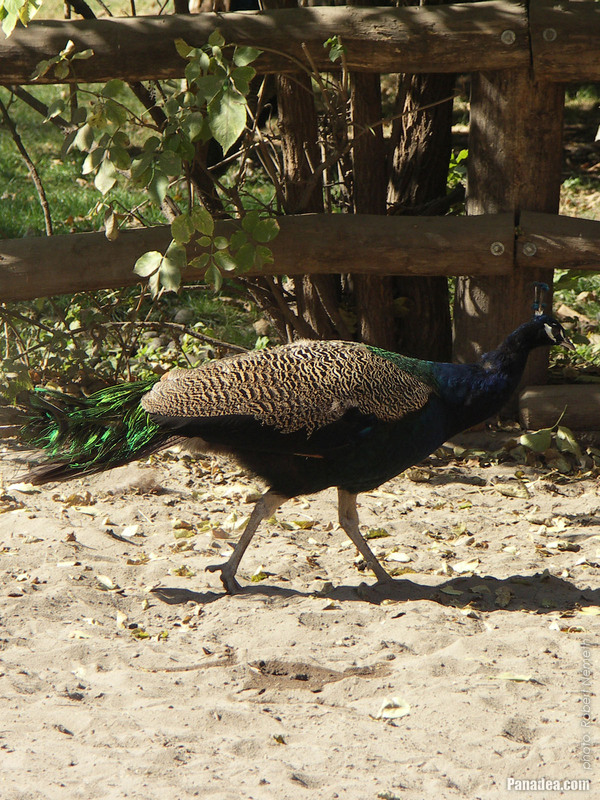 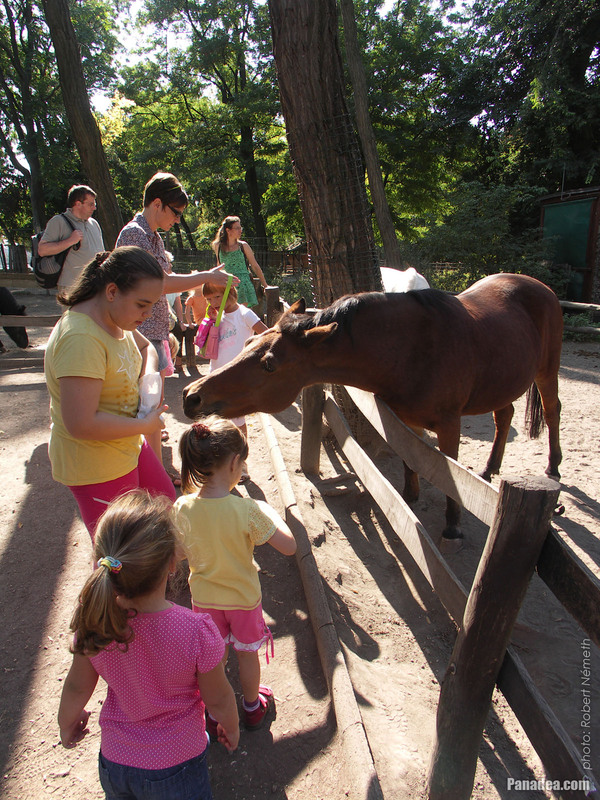 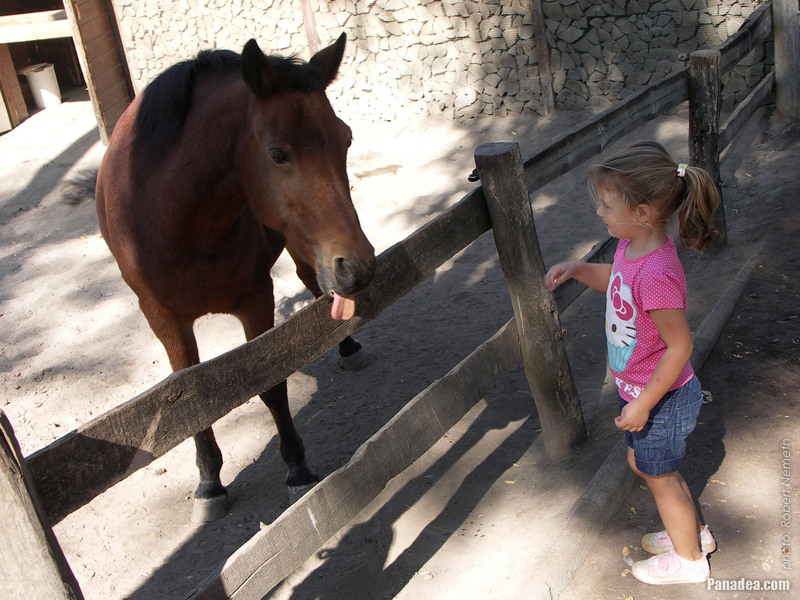 The Pet Zoo was founded in the 1950s, since 2002 it belongs to the Budapest Zoo that cares and maintains it. The admission is free. The enclusures of the fallow deers and other deer species, as well as for example the European hares try to represent the original wildlife of the island. 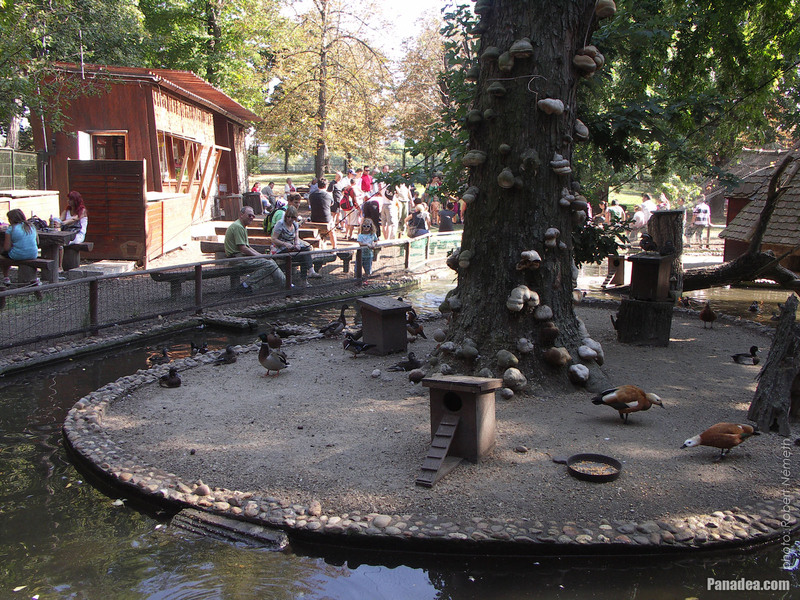 It is relatively well known that in the middle ages the Margaret Island ("Margit-sziget") was called in Latin "Insula Leporum" which means the "Island of Rabbits", and probably not just by accident. 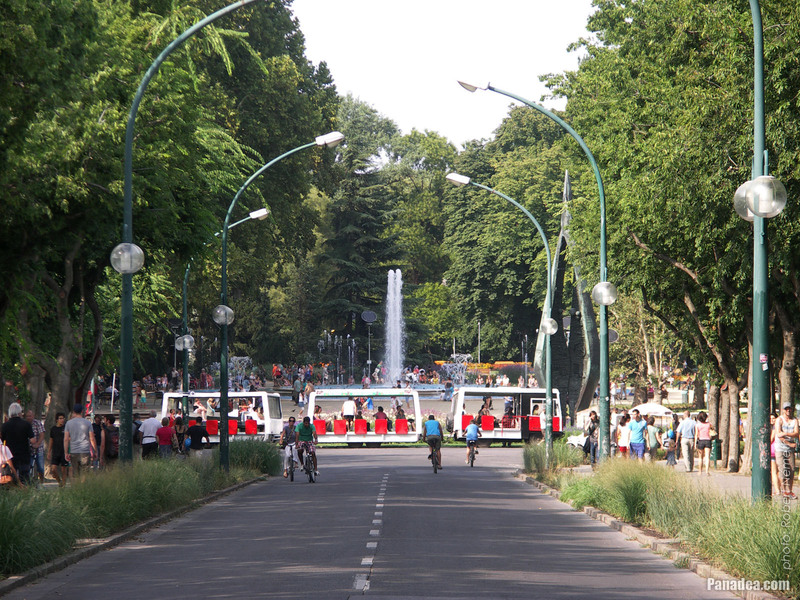 The Centennial Monument on the Margaret Island ("Margit-sziget") commemorates the 100th anniversary of the unification of Pest, Buda and Óbuda towns in 1873, so actually the birth of the modern Budapest city. 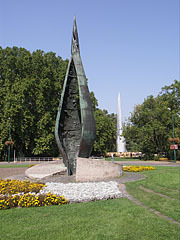 It was created by István Kiss in 1972. The flower bud-like shape with the "petals" that are twisting into each other symolizes this event (the unification), as well as inside the sculpture there are relief symbols of the most representative objects of the past 100 years. 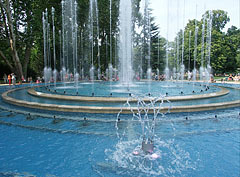 The Great Musical Fountain of the Margaret Island was originally inaugurated in 1962, at that time it couldn't play music. 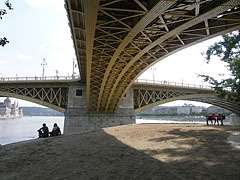 By 1999 its condition was already significantly deteriorated. 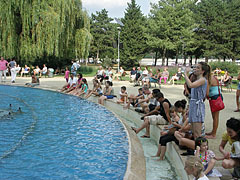 After the renovation of 2002 to entertain the visitors it was equipped with computer controlled music playing capability combined with many variations of water jet effects that appear according to the music (constructed by the Technoconsult Kft. 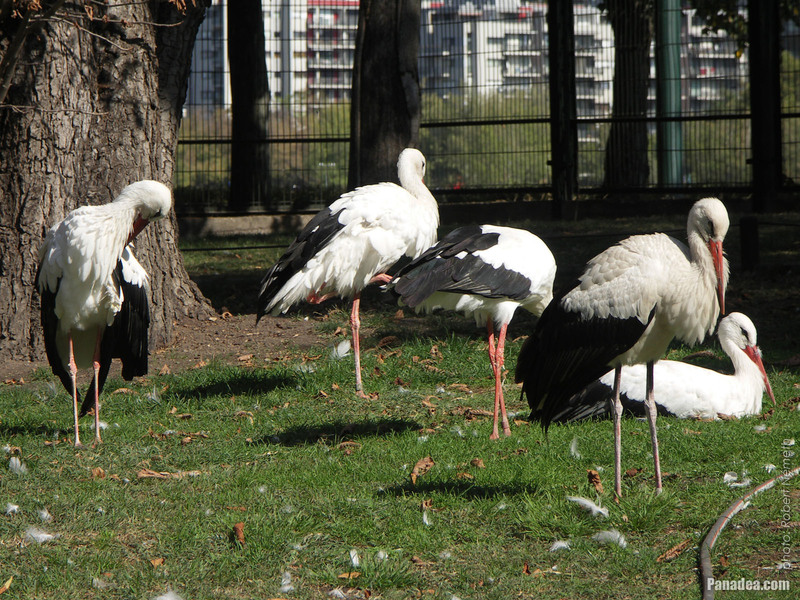 company). 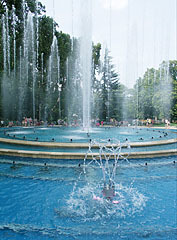 The reinforced concrete structure of the fountain was covered with decorative Süttő limestone. 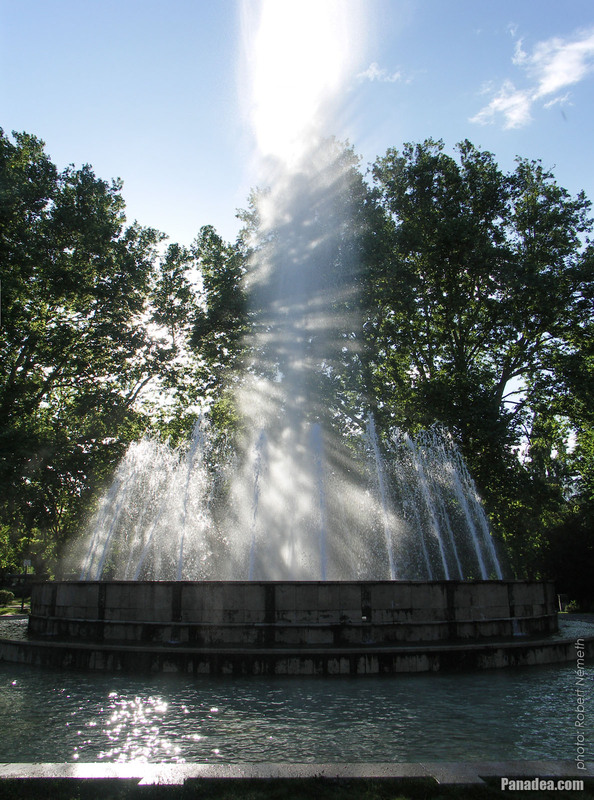 With its 36-meter-diameter and up to 25-meter high water-jets today it is the largest music fountain of Hungary, moreover it is on a prime location in Europe as well. 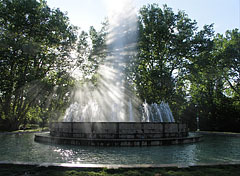 The fountain was undergoing another major changes in 2013. 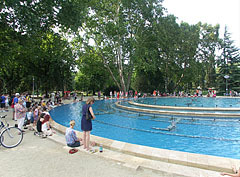 Since 2011 the whole length of the running track on the Margaret Island is illuminated. 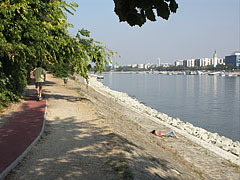 But beside the rubbered running track there is another popular measured runway, that goes on the route of the city bus no. 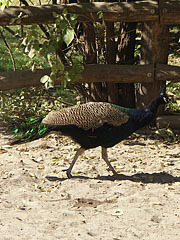 26, on the asphalt road. 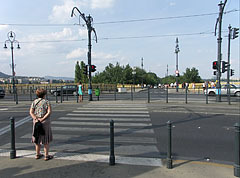 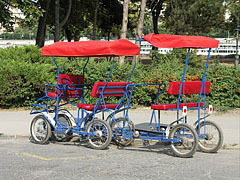 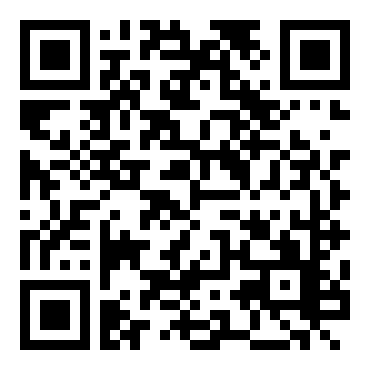 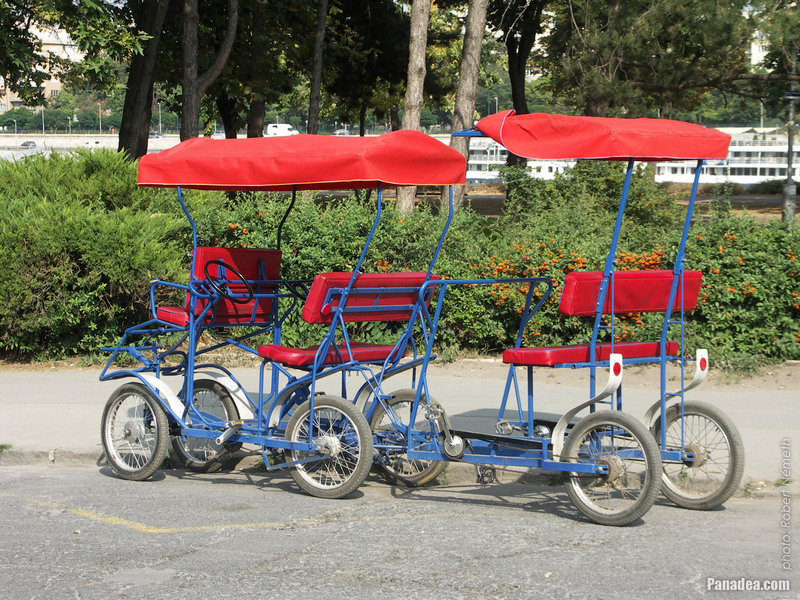 The total back and forth length of it is 2x2.5 km, and except some privileged vehicles only the city buses can use it. 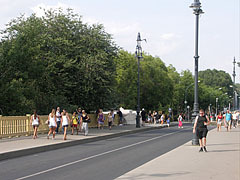 Concerning the length of the track, starting from the boom barrier at the Margaret Bridge there are marks on the road and the posts per every half a kilometer. 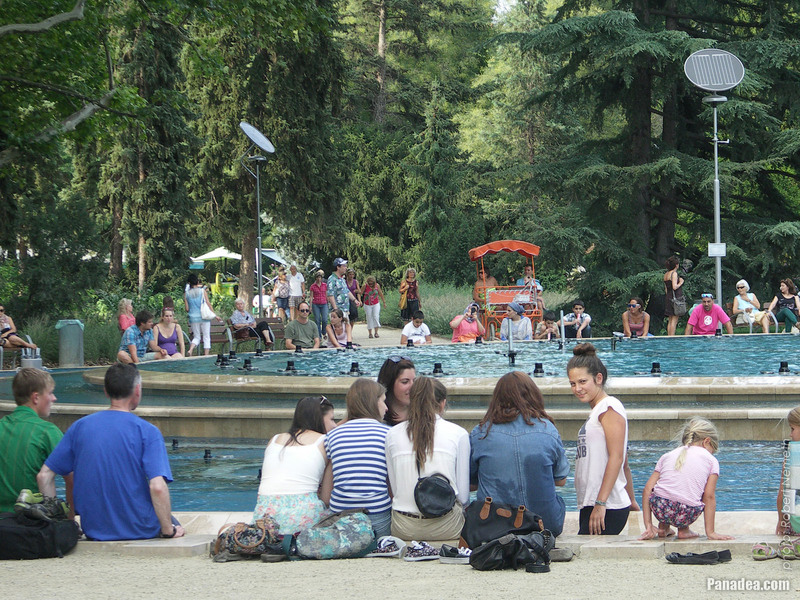 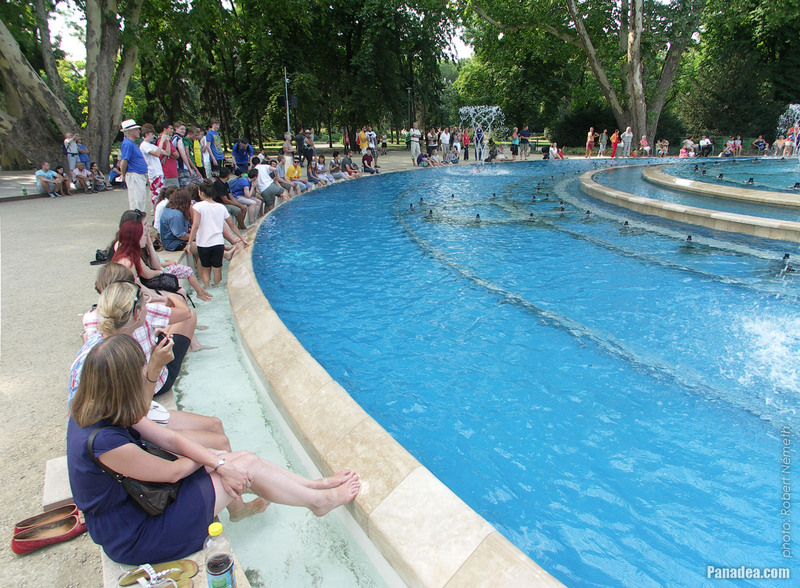 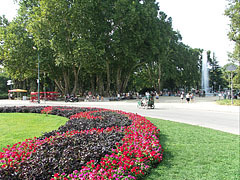 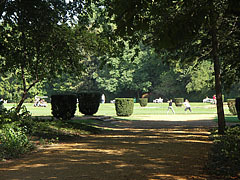 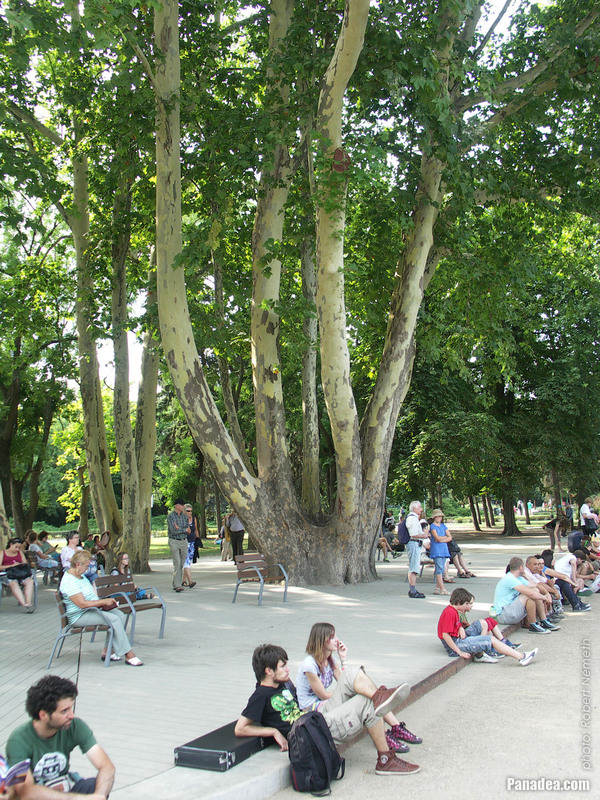 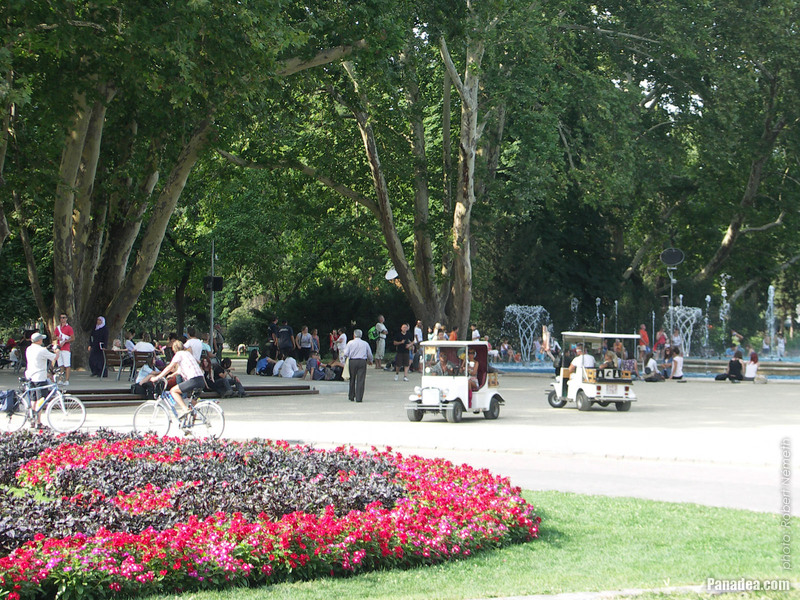 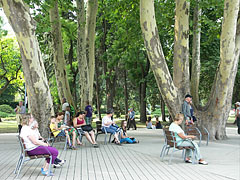 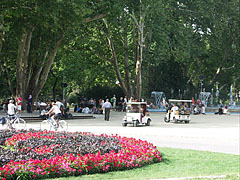 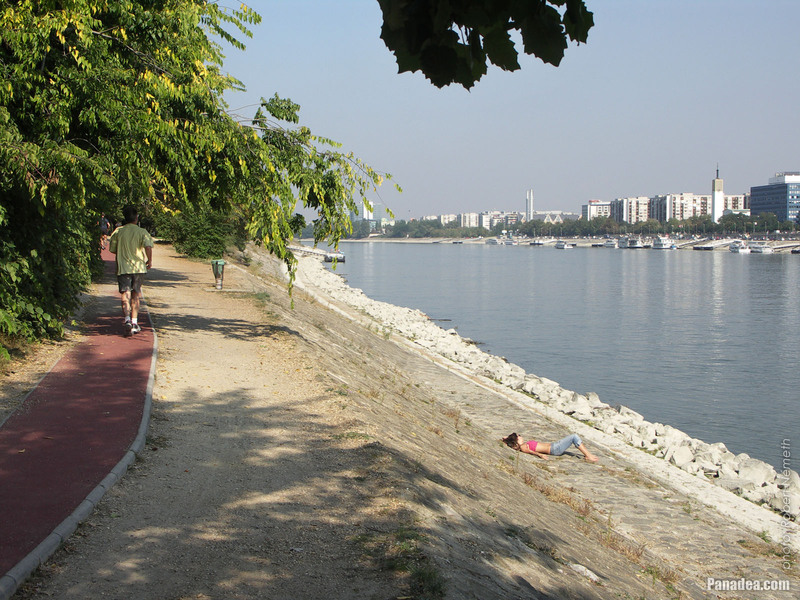 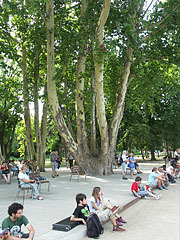 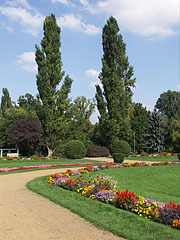 The Margaret Island ("Margit-sziget") in Budapest is very popular among the runners. 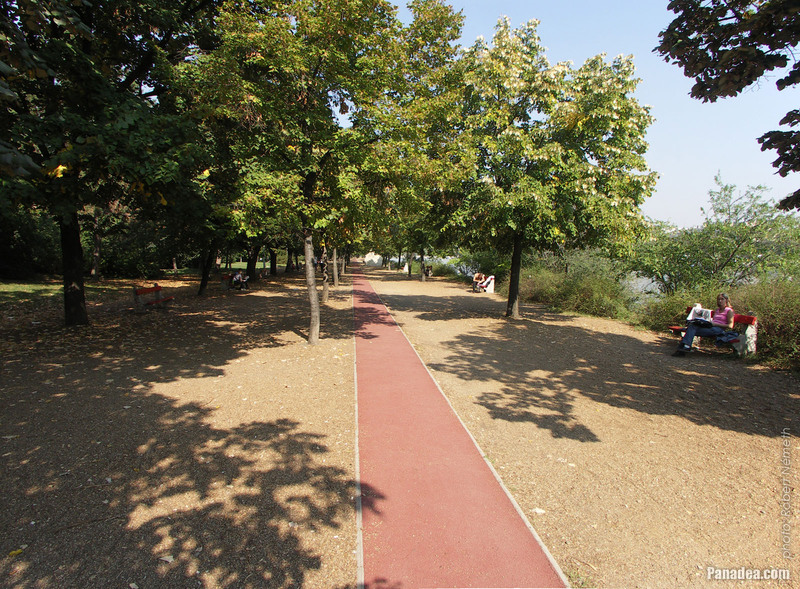 As the board says at the Margaret Island Athletics Center (in Hungarian "Margitszigeti Atlétikai Centrum" or MAC) one lap on the built tartan (rubbered) track takes 5350 meters, but in reality it is just 5300 meters (more precisely 5285 m +/- 20 m). 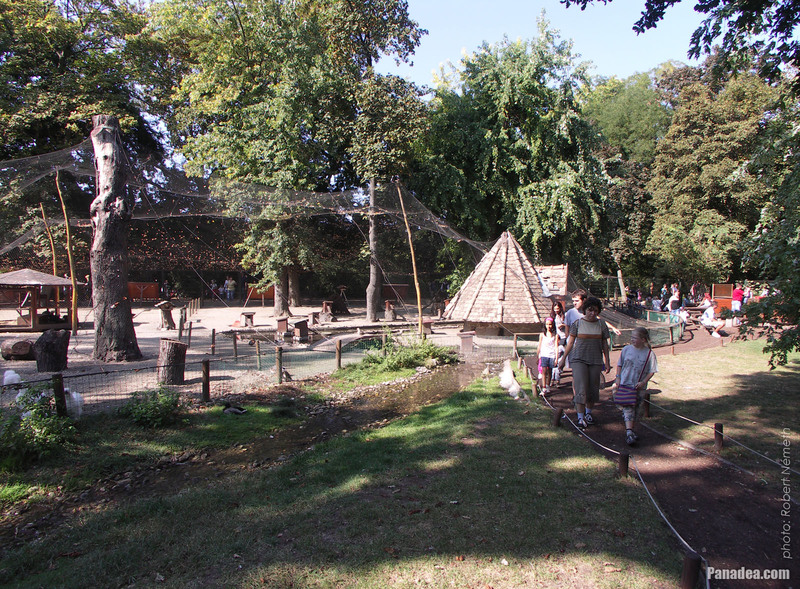 The reason of the difference is probably that the board was placed there before building the rubbered track and therefore the distance was somehow calculated differently. 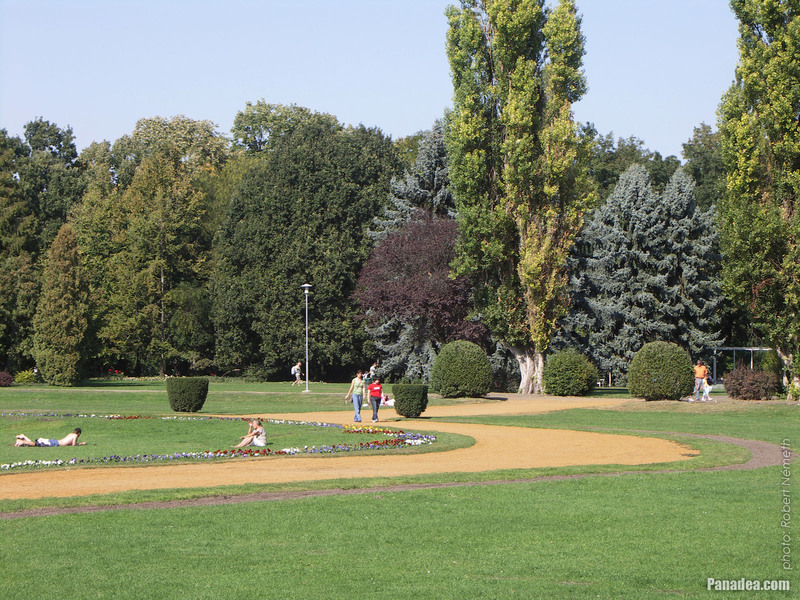 Anyway, regarding the running direction it is generally accepted to run on the track counterclockwise as possible. 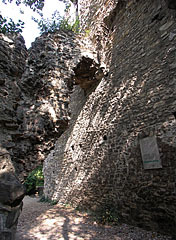 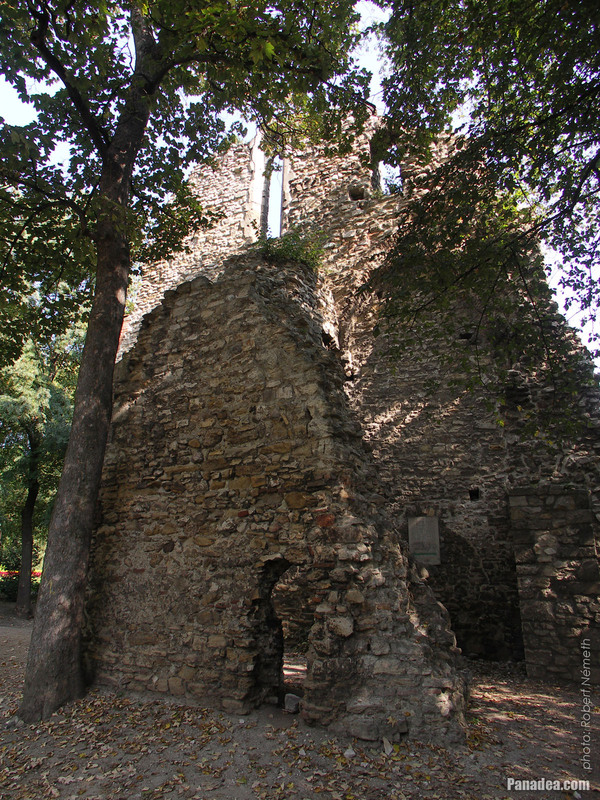 The former single-nave Franciscan church which ruins can be seen on the Margaret Island was built in the second half of the 13th century (around 1270). 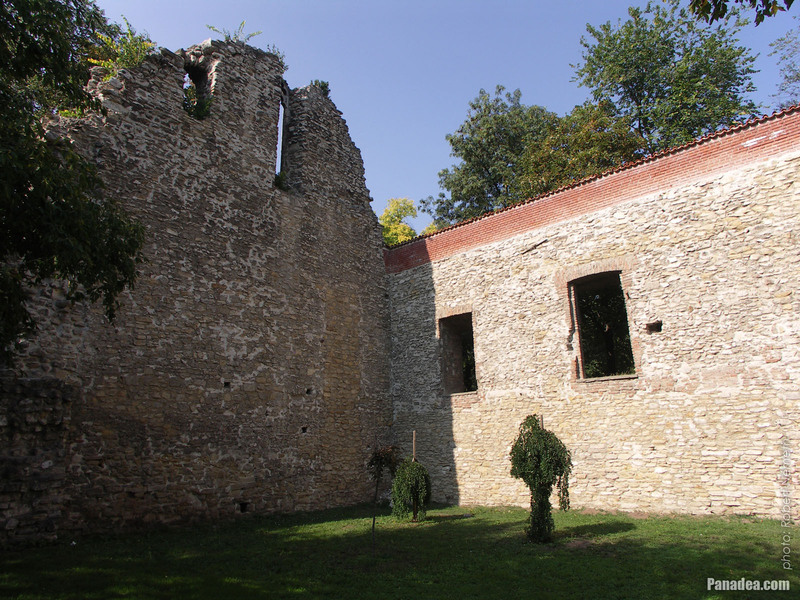 Once there was a cloister attached to its northern side and the summer house of Archduke Joseph, Palatine of Hungary was built on its site in the 19th century, then later it was converted to a hotel. 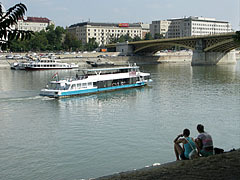 The cream of the Hungarian writers spent a lot of time within its walls, for example here took his vacation János Arany (e.g. 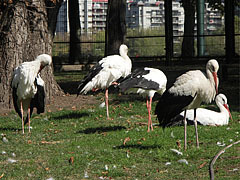 in 1877), Ferenc Molnár, Ernő Szép, Gyula Krúdy and Sándor Bródy as well. The hotel building was damaged in the World War II and later it was demolished.